With Halloween falling on a Thursday this year, it's no surprise this past weekend was filled with parties, festivals, pumpkin carvings, and sugar. So much sugar. And with the sugar comes the candy tax. I always swore I'd never eat my children's candy. I also always swore I'd bounce back to a size six after giving birth. It's funny how often we don't keep those "promises' we swear pre-kids. Though, now that I think of it, that second promise might be easier to keep if I kept my first promise. The first Halloween I stole candy from my baby was when Joseph was only six months old. Though we only went "trick or treating" for the photo opportunities, people filled his bag with candy. "Oh no!" 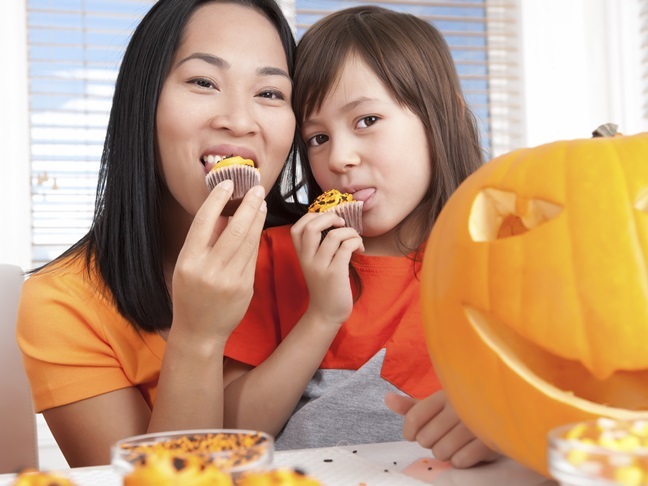 we'd protest as Kit Kats dropped into the plastic pumpkin. "He's too little for candy." We'd get a wink and a smile and nudged on. In fifteen minutes we had a bucket of goodies and a new appreciation for the Halloween candy racket. Now, seven years into it, my ex and I have our division of candy down pat. Our kids don't even question Mommy and Daddy are taxing their haul. A few of my mom friends have contemplated, for a split second, handing out sugar free treats. While I celebrate all that is chocolate and high fructose corn syrup on this candy corniest of all holidays, I admit I have had those moments when I wish more houses handed out bags of Goldfish or pretzels. I would even roll with spider rings and knock off Matchbox cars. Because on Thursday night, after my little colonials are asleep in their beds, the chocolate and sugar is going to tempt Mommy to dive in. Maybe this year I'll resist. Do you eat your children's candy?